Our crew will be setup no later than 3pm (hopefully sooner), parade is at 4pm and kick is at 7pm. We will be in the southwest corner of Lot D (Mehring Way and Elm Street). 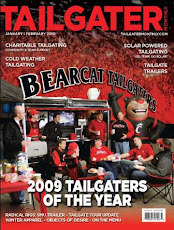 Look for Bearcat flags and the trailer. If for some reason we run into issues in Lot D, we will post updates on our blog, Facebook, etc. As always we will have plenty of food and drink in support the Octoberfest/Zinzinnati theme! Think brats, mets, and sauerkraut. Bring a German theme side to share if you would like and drop a few bucks in the donation box next to beer tap to help us cover our costs. Remember this game is a Ring of Red game, so WEAR RED! Given the move to Paul Brown Stadium this season and scheduling, our crew has decided to focus on a few key games, so gear up and join us for our first tailgate against Miami. Looking for a place to tailgate for this Friday's home opener? we would highly encourage you to stop by Republic of Cincinnati at Longworth Hall lot. All other home games our crew will be meeting up at Yard House prior to the game. Look for a post next weekend for all of our homecoming tailgate details, but you can expect us to GO BIG for homecoming!